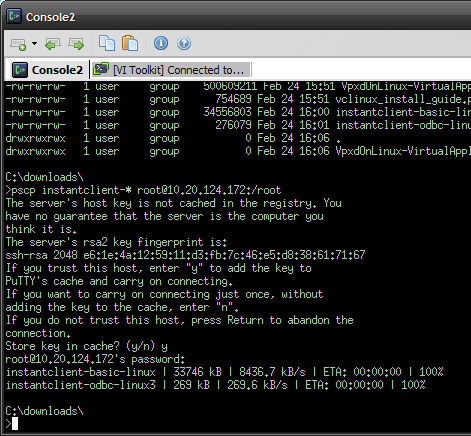 vCenter on Linux is distributed as a virtual appliance; it is really easy to try out. However, the only supported database at the moment is Oracle — this might be a stumbling block for some. While the installation guide covers everything you need to know, here are some quick tips that may help clarify some of the more complicated parts. Download the OVF and import it to your ESX host. NOTE: VMware accidentally included the Highly Confidential Beta Software EULA with the vCenter on Linux appliance. I have confirmed with one of the beta program managers and product management that this is not a private beta. After all, Dr. Stephen Herrod told everyone about it in his keynote today. Next, configure networking via the menu option or determine the current DHCP IP address — log in as root/vmware and run ifconfig (or just look at the VI Client summary for the VM). 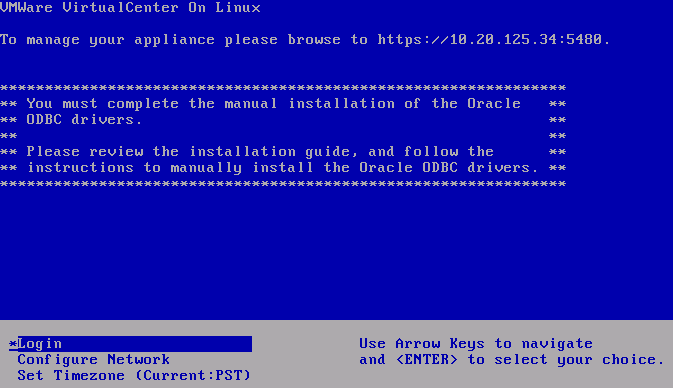 I’m not going to cover how to install Oracle. Let’s just say it’s not a next-next-finish operation. You can get the free Oracle Express Edition or use an existing instance already present in your environment. What I will give you is a simple recipe to prepare your Oracle instance for hosting a vCenter database. Save the following code as “vpxadmin.sql” on your Oracle server. This will create a tablespace and credentials for your vCenter database. Instance name – by default in Oracle this is often “orcl” but you or your DBA may have changed it. You probably need the fully-qualified version, which would be something like “orcl.whatever.yourcompany.com” — this likely is not the same as the FQDN/hostname of the server. 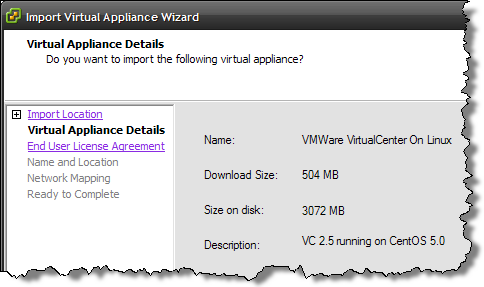 In the following example, I am using “vcdb.vmware.com” as my instance. If you already have a recent VI Client installed, you should be able to use it — or download and install by pointing your web browser to your vCenter VM IP. When you are ready, log in to your new vCenter on Linux (use the root account, not the database account), create a datacenter, add hosts, and try it out. Would you or someone else please comment upon whether this Linux appliance presently only does Virtual Center or whether it also includes Update Manager (either now or in the future)?? Tom, the present release is a technology preview of the core VC functionality. None of the plugins (Update Manager, Converter) are currently included. No comment on future plans. Oracle requirement freaking blows. I will tell you this much: The people that are eager to see vCenter for Linux are not the same people eager to use Oracle regardless of whether or not there is a money-saving path to take. I’d go so far as to say that I see these things as nearly mutually exclusive. 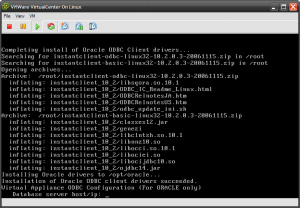 I’m one of the people eager to have VC on linux, but I don’t want to fool with Oracle at all. I’d rather have windows. I find it a little odd that you have VMware with really smart engineers and developers putting out all these products that are lean, mean, and innovative, — then with Virtual Center they use the most bloated, contorted, and slow technologies to do anything. Every problem I have at the hypervisor is clear and concise to diagnose and debug. Every problem I have with VirtualCenter is this hit-and-miss affair of bad log files and restarting services hoping that all the shaking will knock the gears back into place. The client application is the slowest laggiest piece of junk I ever have to deal with. It makes Exchange 2007’s management console seem fast! John, I appreciate you taking the time to share your perspective — I will pass it on to some of the leadership at VMware. What if the database was also distributed as part of the appliance and it happened to be Oracle, but did not require esoteric configuration or maintenance? Would that be more appealing? Why would it be unsatisfactory to use mySQL???? I do understand that they’ve already coded everything for Oracle on Windows, therefore that work transfers over to Oracle on Linux, but I would still like to see a really good reason why they can’t use mySQL instead. Your above idea is good but…what happens when the db breaks, there’s issues caused by or related to Oracle, which most people don’t even know how to work with…but there’s lots of info easily found about mySQL. I thought it was a no-brainer that they would use a mySQL database. 1) People who want a cheaper solution. 2) People who want to fit virtualcenter into their existing administration/policy/environment etc. You can satisfy the first group of people any number of different ways, including simply making virtualcenter less expensive, but I believe that you must pay more attention to the second group. See, Oracle, no matter how you deploy it more often than not has a cost involved to this second group of people. These are the people that by choice or by force have to deal with bringing another alien application into their environment. And databases are very expensive applications to deal with when you are talking about policy frameworks and compliance and certification and all of that. People need to leverage their existing database systems. At our company, we have all these little bits and pieces of policy to deal specifically with our virtualcenter server because it’s sitting out there all alone talking to its lonely MS SQL Server database. 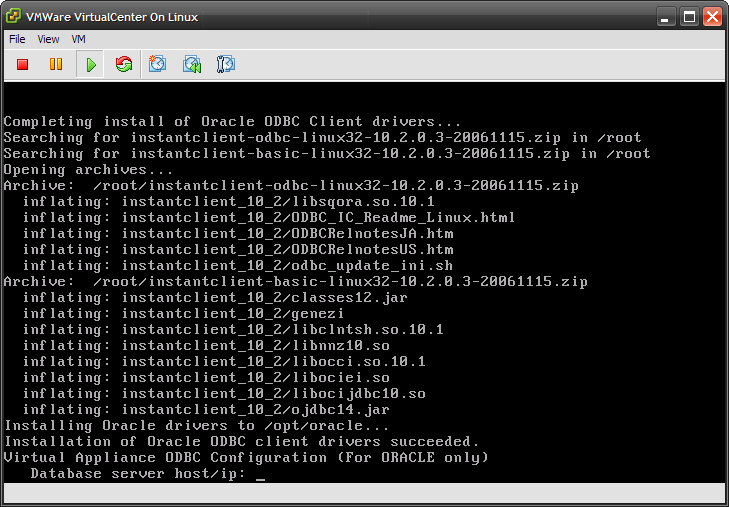 You can bet I’m not going to go through that all again with Oracle. What I want to do is to throw out all of that specific policy and configuration management and backup headache and handle it like we handle every other linux app on the face of the earth. Now, maybe you already use Oracle; great. A lot of people do. Please continue to support it. But in that same vein, I also think that vSphere vCenter for Linux (or whatever it is going to be called) should at minimum talk to SQL Server and MySQL. Ignoring MySQL on the Linux product is ignoring the gorilla in the room. I have it on good authority that every Oracle license ships with this little bottle of red stuff that makes the gorilla invisible when you drink it, but there are lots of people who haven’t had the pleasure. — Or you can continue to have this debate with your customers every single time you show them the back of the box. I’m firmly in the camp that would LOVE a vctr **appliance**. Having a windows box around just to run virtual center is a nuisance. So is an external database for vctr. While we *do* run Oracle (among other DBs), we would prefer to decouple vctr from EVERYTHING else (hence the desire to have an appliance) Whatever DB solution, I’d prefer to see it embedded in the appliance, installed automagically and isolated from the rest of our environment. 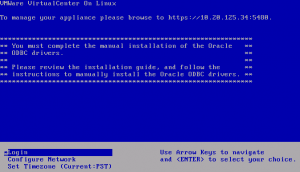 I understand that a DB is required for vctr, and I think a lot of the grief on this issue stems from the install steps of “download and install the Oracle ODBC drivers” then “connect to the Oracle instance that you already have installed” which is a little beyond what I’d expect from an appliance. If it’s bundled and “hidden” in the appliance, you can use flat files or SQL Server running via Wine for all I care 🙂 That said, if I were on the project team, I’d be porting the SQL to postgres as we speak. Mitch, thanks for the additional feedback on this topic. FYI Key leaders in the vCenter R&D group have been made aware of the various comments on this article. i really don’t care on how easy/difficult the installation is, but I think is very important to support MySQL. In the case of an appliance I’m sure it is a lot easier to deal with an embedded MySQL server than an Oracle one. MySQL uses less RAM, less disk space, it’s easy to install, configure and to do maintain. Right now having vCenter on Windows forces me to have a Windows Server box, and just because it’s cheaper than Oracle, a MS SQL Server. Before this we did not have any windows servers in our environment, so you gave MS one more customer. Hope you can have a great Linux version of vCenter with MySQL support, or some other embedded database that does not have the restrictions of Oracle XE. I think you should keep your products MS free, support them for the tons of clients you have that run on MS, but try to avoid throwing more business to MS and for that matter to Oracle, that is also trying to get into the virtualization market. Carlos, thanks for that perspective. VMware Product Management is well aware of this particular customer need and it will certainly influence future product direction. Exactly how and when is to be announced. With Hyper-V coming along there is going to be a serious push from Microsoft into the space currently occupied firmly by VMware. Personally being a Unix person I dont care for microsoft’s policies, architecture or the hassle of dealing with their licensing, installation methods and lack of clean and concise information (eg Their platform usually requires quite extensive “poking” to debug). From what I’m seeing of the management solution – why would a shop with a solid windows staff use VMware over hyper-V ? One of the reasons is “cross platform” features, but generally most shops that have robust skills in their IT staff tend to avoid Windows only solutions (they cause more trouble than they are worth) and instead go with the trivial deployment and more sane management provided by a *nix. These shops (almost every one I’ve ever worked in) wont use VMware until the management comes up to par (eg cross platform without hassle). All of that being said I dont understand why VMware regressed 10 years and made all of its management applications desktop based. The management of the cluster should be inside of an “appliance” or custom VM thats not running anything else that requires a license, patching or maintenance. This can be fairly easy to accomplish if you utilize Web technologies and an opensource database. It is not difficult to package up one of the many web and DB servers into a small image (hardened accordingly) like every firewall, storage and /dev/random appliance vendor does. At that time the management can be performed from any Web enabled (and theoretically console) device regardless of platform. Nothing VMware is doing is so special that it cant be cross-platform, and if the code is that jacked up I probably dont want it anyway. Long term VMware should look at a solution not-unlike RAC which doesnt have a dedicated “management” host – instead that portion is handled by the nodes via a negotiation where the IP lands is unimportant if everything is truly HA. Risar, thanks for chiming in with some very well-thought feedback. I know that many others share the same opinion. All I can say is that VMware management is listening. Hey Eric, Have any updated information on vCenter on Linux? It seems to only make sense to allow MySQL Enterprise Edition to be supported and to allow the vCenter Client to be ported to Linux and/or at least Mac. No one likes to be tied 100% to the Microsoft platform. It is a pain in the neck that you are forced to pay for thousands of dollars for a SQL Server license, when we could be using MySQL on Linux or even Oracle 11g on Linux. There must be a way to port the vCenter client to Linux on GTK+ or something. Even porting to Mac would be a huge improvement! Hi All, do you have any news about vCenter Server for Linux? I’ll just echo what everyone above has already said. We are also an entirely Linux shop with our solitary Windows install running vCenter and SQL Server. Having a Linux vCenter (with update manager, etc) would definitely be the best option. It would be really nice to have support for PostgreSQL (although we could live with MySQL 🙂 ). After watching the way that Oracle treated the Open Source community and associated projects. I would definitely say focus on PostGreSQL primarily. Oracle is going to stomp all over MySQL. Let’s make this prediction. Oracle DB is profitable. MySQL has been leveraged into LAMP beyond imagination and drives many websites and projects. However, under the tutelage of Oracle, a developer or IT strategist or CIO would be a complete fool to bet on MySQL without realizing that either the platform will be completely destroyed through integration/migration and consolidation into something more “Oracle”. PostGreSQL is a reliable and stable platform that can really scale. It makes more sense at this point to focus efforts on PostGreSQL. However, then comes in the reality that we live in a hyper-connected world that “cloud-computing” and off-premises hybrid’s will become a norm and not an abnormal context within the next 3-5 years. Here an now is fine, but it needs to perform for the future and I am sorry. I think that MySQL definitely may not be a good option in the coming 3 years. Well what’s the latest status? I am prepared to start migrating from ESX 3.5 to vSphere 4.x. I too would like to dump the Windows based vCenter VM. Is there a reliable, stable, easy Linux vCenter appliance available now? vSphere 5, announced yesterday, has a fully-supported vCenter appliance that is based on Linux. Do you see any problem to migrating from 3.5 directly to 5.x or is it needed to go from 3.5 to 4.x and then to 5.x? What’s really funny is that this 2 1/2 yo thread was my first thought after reading the announcement. Sadly my joy was severely muted by the VRAM tax that VMWare is imposing with vSphere 5. Though, if the web interface is good enough, the new windows-less management tools may just be enough for me to swallow the new licensing scheme. This is great news. Is it still going to support Oracle? Will it lay down on a RHEL host? Is the documentation going to be pre-released? Do you have a link for both the documentation and where I can start funneling admins for training? I am enthused about regaining the security in my infrastructure and look forward to putting this to the test for evaluation and feasibility of full scale deployment. I’m just now getting ready to migrate to VMware 4, when I hear about VMware 5! A Windows-less stack is something I’ve been hoping for. Now I just wish VMware 5 was already released. I wanted to start on this today, but I guess it will be worth it to wait. It’s annoying that I have to have a Windows server around just for vCenter and I have to keep a Windows desktop just to run the client. I ended up acquiring new hardware. I set up a new ESXi 5 cluster on th new harware, configured access to my VM storage (a NetApp using NFS) and easily fired my ESX 3.5 VMs up on the new cluster using the Linux based Virtual Center Server VM. I didn’t need to move anything, but I did need to fiddle with the NIC setups since the MACs changed. Works great! So far, no problems at all. The new cluster is stable, vMotion and HA are working perfectly and my VMs are running better than ever (nearly twice the clock speed and gobs of cores and RAM compared to my old setup). I was never doing anything all that fancy with the old Virtual Center Server, so it is real nice to get it off Windows. Needed to stumble around a bit to get users setup since it is no longer using the Windows SAM to manage that. No big deal though. I recommend going to ESXi (on new parallel HW) for any small clusters out there. so much they decided to bookmark it. I’ll unquestionably be coming here more often.